What Do Animals Do During Fall? Where do animal pests go when the whether becomes chilly? Surprisingly, many of them stay active before the snowy, winter months hit. 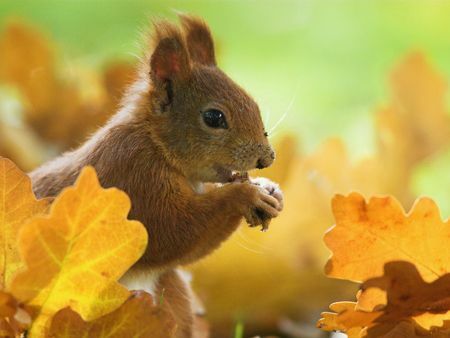 Read more to discover what do animals do during fall. Many birds and insects migrate to warmer areas during the chillier months of fall. Because temperatures begin to drop during the fall season, these creatures begin to find more suitable conditions. For example, swallows migrate south once the weather begins to cool and their food sources dwindle. You may think that since some animal pests are leaving during this season you’ll see less activity, but it’s far from the truth. In fact, you may see more activity in your home at this time of year. Other animals prepare to hibernate during the fall. Squirrels, chipmunks, and groundhogs will gather food to store for the winter. Although chipmunks and squirrels do not go into a true hibernation state, they a relatively inactive during the winter. This leads them to frantically stockpile leftover food near your garbages or from your bird feeders. These small mammals can be quite pesky during the fall. Bats will also hibernate during the cold months. You can expect their presence to taper off as the insect population dies down with the cool weather. In addition, wasps and bees will still be active during the fall. They do not hibernate until winter. If there’s a nest near your home that needs to be removed, unfortunately the cold weather won’t be enough to detract them. Make sure to call pest control for assistance moving wasps or bee nests. Many other animals stay active during this time of year. Skunks, for example, stay in their dens but are awake during winter. You’ll see (and smell) plenty of skunks during the fall. Raccoons behave similarly, and will stay active year round. This means, you still have to be vigilant and remove outdoor food sources for these pests. In fact, you may notice more pest activity because homes have plentiful opportunities for food, while the cool weather limits natural sources. Opossums are also active during the colder months. You may be surprised to know that they’ll even become active during the day, though they are nocturnal. Nonetheless, you should never take a chance with an opossum behaving strangely, as it may be infected with rabies or another disease. Lastly, rodents remain highly active during the cold months. You may see more mice and rats in your home during the fall, as fields are plowed and they escape to your safe home. In addition, homes are full of food sources and provide shelter from the elements. Your rodent problem may be highest during the fall. Call Attic Solutions to remove your pests safely and efficiently, so you can enjoy the fall season without pests. This entry was posted in Animal Removal, Bats, Bees and Wasps, Birds, Chipmunks, Groundhogs, Opossum, Raccoons, Rats & Mice, Skunks, Squirrels and tagged are mice worse in the fall, autumn animals, fall animals, hibernation, migrating, migration, pest control, rodent control, what animals migrate, what do animals do during fall, where do animals hibernate? on September 7, 2016 by Attic Solutions.